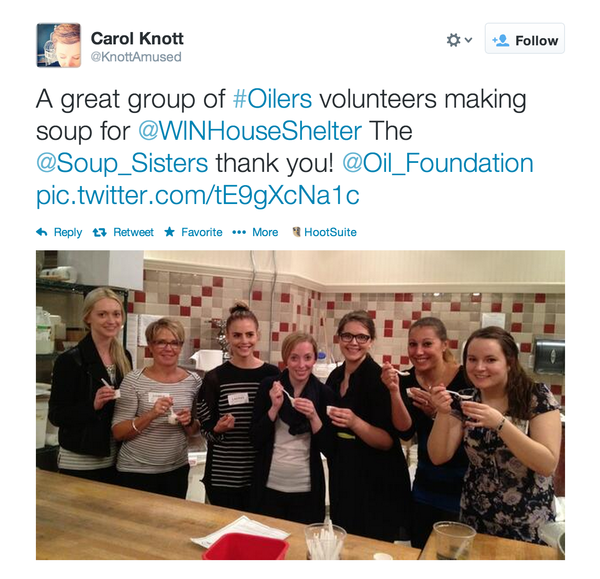 On Monday evening, the Oilers Ladies and front office employees teamed up with Soup Sisters to make and donate soup for WIN House. Soup Sisters is a non-profit organization dedicated to helping women and children. With branches across Canada, the organization works to aid victims of domestic abuse and youth homelessness with the comfort of a bowl of soup. It’s a simple concept with a powerful impact. Soup Sisters Edmonton supports local WIN House and YESS, and the soup we made last night was packaged and immediately sent to the WIN House for women fleeing domestic violence. We had the chance to learn more about these organizations and how the soup we prepare actually makes a difference. 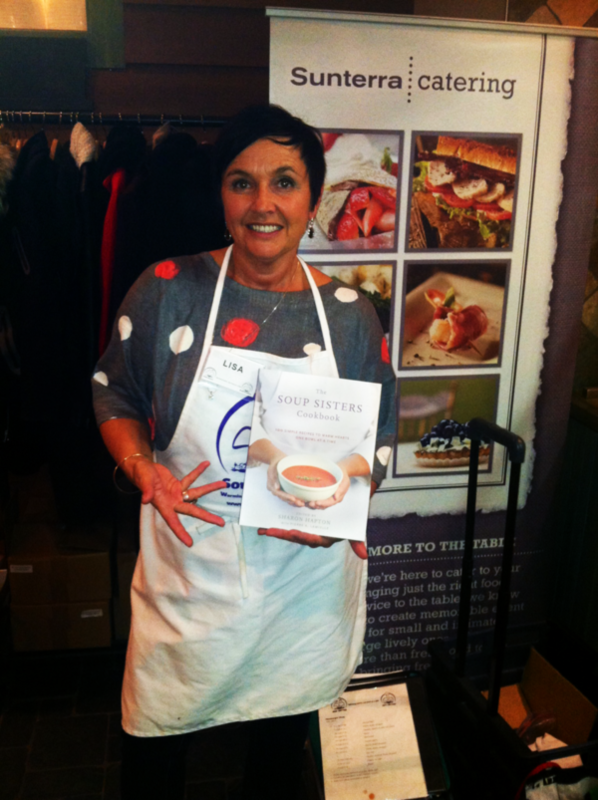 The organization has flourished in Edmonton, and the Soup Sisters are booked all the way through 2014 and into 2015. If you’re looking for ways to help, you can purchase their cookbook online or from your local Chapters bookstore. The proceeds go directly to women and children in need. As partners of professional athletes, we find much gratification in volunteering our time to those in need. While I’m familiar with living in North America, a lot of women uproot their lives in countries like Sweden, Finland and Russia to support their partner’s NHL career. Finding your place in a new city can be hard enough on its own, but brushing up on English (which may be some women’s third or fourth language) is another challenge. Giving back to the local community that supports us is just one way we can say thank you. I’m still relatively new to this lifestyle, since Ben has only been playing professional hockey for four seasons, but I have a lot of respect for the women who have a lot more experience and have helped me acclimate. This was my first chance to volunteer in the city of Edmonton, and I’m looking forward the next opportunity to meet more people who call this city home. 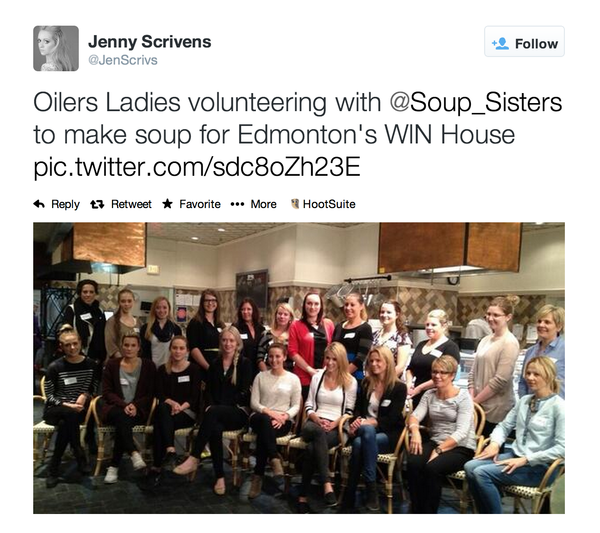 Nation Editor’s Note: As a thank you to Jen Scrivens and the Oilers ladies, Wanye will be donating $1000 to Soup Sisters on behalf of everyone at OilersNation. Thank you, ladies! Jenny Scrivens is the the Anti-Lauren Pronger! …and a tip of the cap to all the ON folks who responded in such a positive way to Jen Scrivens’ post. Nice to get away from the vituperative* language for awhile. * It’s okay Wanye – you can look it up. All these positive comments about a fine group of ladies giving back to the community and someone actually has the gall to trash these appreciative comments. Somebody needs a cuff up side the head I think. A link or transcript of this article needs to be sent to any and all members of the (eastern) media who said Jen Scrivens wouldn’t like living in Edmonton. If they haven’t been told this before, they should be told to go urinate up a rope. Volunteering is one (great) thing; but taking time to write about it and explain how they use community service as a way to meet people is even more special. Enjoy this article, everyone. Chances are, you’ll never hear about it anywhere else … not on Trade Centre and not on Free Agent Frenzy Day, when the narrative will be that no one wants to come here and nobody will like it here if they do. I move the Jen Scrivens be named the new Wanye of Oilers Nation and as such be granted all rights and privileges that go with the title including unlimited Oodle Noodle and the keys to stately Wanye Manor. WTF?! WHERE AM I SUPPOSED TO LIVE? Wait, could I be legally adopted by the Scrivenses? If so, this plan is fine by me. Street hockey with my new parents would be the bomb. Jen…start the paper work! Young Wanye craves parental guidance and approval. You’d change your mind pretty fast if he went 59-0 on your sweet, sweet Wanye Street Hockey Clapper. Wait, would that then make them my grandparents?!?! Good on you ladies and good on you Wayne.This is what Edmonton is all about. JEN SCRIVENS IS ON OILERSNATION?!?!?! Wanye! This is a coup! I didn’t think you had any soul left to sell to pull this sort of thing off! This aint got nothin to do with me homie. This was all the First Lady and baggedmilk. No wonder you finally gave baggedmilk a job. He actually earned it! So is Jen going to be a regular blogger on this site now? First lady of Edmonton, Way to go!! Thank you for your contribution to the community. It’s a tough time in Oilerville right now and this is the type of thing that reminds us of the off-ice value the Oilers bring to the city. Great article and a great reminder for SOME Oilers fans that these players and their families are members of your community. Sure they make lots of money to perform and it can be frustrating for fans when they struggle. These are not just hockey players but fathers and husbands and contributing members of our community. I hope some people can remember that the next time they go on an irrational rant about one of these players or start swearing about the team or throwing jerseys on the ice. I have heard some really ugly things about these young men in recent days and Oiler fans need to start living up to their claim as : “the best fans in the world” and throwing your jersey on the ice is not helping that claim at all. Hey maybe the Soup Sisters will suit up for The Oilers Vs The Sharks? Despite the product on the ice this was a super great read. Kudos to the LadyOilers for their work in making Edmonton a better place. I think we should make this happen, out with Lowe in with the First Lady!! Thanks for being part of the community and welcome to Edmonton. I love hearing about great projects like that. It should remind all of us that hockey is just a game and that there are much more important things in the world. The partners of the players usually get forgotten about and I know they always do great work in the community. GM’s that there is a real life side to the players and their families and it would do good to have these reminders when many comments at ON are trashing players and taking shots at them. Jen, welcome to Edmonton, and welcome to the Nations! Great cause and it’s neat to learn about the Soup Sisters, WIN House and the Oil Foundation and all that they do and who they help. And it’s nice to have a female voice around here again, touching story and thank you for being a volunteer Jen!! Could the powers that be, the OilersNation braintrust or the jeanyuses that run this fine example of interweb bloggery please ask Mrs Scrivens to be a regular content contributor? The current state of the team and their lackadaisical, sub-par performance for the last 8 years has led many of your readers to lose perspective. It would be great to hear about some of the good things that the Oilers extended organization does for the community. Give us some water on this long walk through the desert. Please. Maybe the men can support the men in our community who also fall the cracks. Jen Scrivens blogging brought a smile to my face. We need more people like the Scrivens in Edmonton. First of all – a warm welcome to edmonton, Jen! I am so happy to see you doing this; like al lot of others who commented here it too made me smile to see that. It’s really great to see you giving all of the other Edmontonians a chance and coming here to lend a hand in our community, especially! Good on you – and all the others for doing this incredible work. All of you Oiler women, as well as everyone else there that helps out too! One more thing: would you (please) keep on writing here?! I hope you too have noticed the sincere overwhelming response from the regulars here! Normally you can’t get us to agree on the sky being blue! Maybe you can let us know how it is going through the off-season, even what it’s like moving here, and telling us about the great things you Oiler wives and girlfriends are doing, or that you would like to make us aware of!! I think we’ve all greatly enjoyed hearing the stories of our resident ex-NHL writers (I know I have!) Hearing from the current wife of a player would be a refreshing and interesting take on things! !